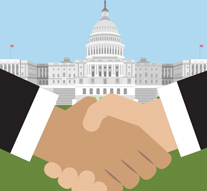 Overwhelming bipartisan majorities support proposed legislation that calls for extending the period that former government officials must wait before they can lobby the government and prohibiting former executive branch officials from ever lobbying on behalf of foreign governments. Similarly large majorities favor ending the support the government currently provides for former US Presidents. The survey of 2,482 registered voter was conducted by the Program for Public Consultation at the University of Maryland (PPC), and released today by the non-partisan organization, Voice of the People. To ensure that respondents understood the issue, they were given a short briefing on the proposal and asked to evaluate arguments for and against. The content was reviewed by Congressional proponents and opponents of the legislation to ensure that the briefing was accurate and balanced and that the arguments presented were the strongest ones being made. Currently, former Members of Congress are prohibited from lobbying Congress for two years after leaving office. Proposed legislation H.R. 383 by Rep. Posey [R-FL-8], H.R. 796 by Rep. DeSantis [R-FL-6], H.R. 1951 by Rep. O’Halleran [D-AZ-1] and H.R. 346 by Rep. Trott [R-MI-11] calls for extending this period to five years. In the survey, 77 percent approved of such an extension, including 80% of Republicans and 73% of Democrats. Extending the waiting period for senior Congressional staffers from the current one year to two years—as called for in H.R. 383 by Rep. Posey [R-FL-8]—was approved by 77%, including 79% of Republicans and 74% of Democrats. Currently, senior executive branch officials are prohibited from lobbying their former agency for 1-2 years depending on how senior they were. H.R. 1934 proposed by Rep. Gallagher [R-WI-8], S.522 by Sen. Tester [D-MT], H.R. 796 by Rep. De Santis [R-FL-6] and H.R. 484 by Rep. De Fazio [D-OR-4] call for extending this period to five years for all such officials. This proposal was supported by 75%, including 77% of Republicans and 71% of Democrats. “The American public seems to be eager to drain the swamp in Washington,” commented Steven Kull, director of PPC. However, support did not go so far as to call for a lifetime ban on former members of Congress lobbying as called for by S.1189 by Sen. Bennet [D-CO] and H.R 4187 by Rep. Hollingsworth [R-IN-9]. Only 29% of respondents supported it, including 33% of Republicans and 24% of Democrats. Currently, Americans can act as lobbyists for foreign governments, provided they register and report their activities to the US government. Senior executive branch officials are only limited by the 1-2 year restriction for lobbying their former agency. Proposed bills H.R. 796 by Rep.DeSantis [R-FL-6] and H.R. 484 by Rep. De Fazio [D-OR-4] prohibit former senior executive branch officials from any lobbying on behalf of a foreign government for the rest of their life. This proposal was favored by 75%, including 81% of Republicans and 70% of Democrats. The Trump administration has required political appointees in its administration to pledge to not lobby their former agency for five years and to never lobby the US government for a foreign government after they leave office. The sample is large enough to enable analysis of attitudes in very Republican and very Democratic districts (based on Cook PVI ratings of the district the respondents live in). In all cases, red districts were just slightly more supportive of the proposed restrictions. Another set of questions presented a proposal to end the financial support for former US Presidents, as called for in H.R. 2298 sponsored by Rep. Sensenbrenner [R-WI-5]. Currently, former US Presidents get financial support to cover the ongoing costs associated with the activities of being a former president, including office space, staffing and travel. In 2017, the government will spend approximately $4 million in support for the four former US Presidents. Seventy-two percent favored the proposal, including 85% of Republicans and 60% of Democrats. In very red districts 77% favored the proposal and in very blue districts 61% favored it. The survey was conducted online from September 7- October 3, 2017 with a national probability-based sample of 2,482 registered voters, provided by Nielsen Scarborough from Nielsen Scarborough’s sample of respondents, who were recruited by mail and telephone using a random sample of households. The margin of error was +/- 2.0%.